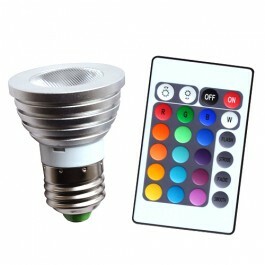 New Technology LED RGB 3 Watt color changing bulb! This amazing little LED light bulb boasts 16 colors to choose from that run the whole length of the rainbow: Red, Magenta, Burnt Orange, Orange, Yellow, Green, Mint Green, Aqua, Robin’s Egg Blue, Blue, Electric Blue, Lavender, Purple, Indigo, and White. Whether you want a color or just plain white from a light bulb, you no longer have to choose what fixture to buy--this bulb has it all. There is a remote control that allows you to choose the color, set the brightness to one of 4 levels, and to select from 4 modes: Flash, Strobe, Fade, and Smooth. The remote control for this full color LED bulb features an on/off switch. And all controls are contained inside the bulb, so it’s ready to use when you screw it in. Use this bulb in any floor lamp, table lamp, recessed lighting fixture, or track lighting that accepts an E27 bulb. Unlike other 3 watt RGB bulbs on the market, a new Matt Lens version of this popular item makes color transitions smoother and light coverage more uniform, separating it from other low quality 3W RGB LED lights. This low lumen bulb is perfect for mood lighting applications. It is not a substitute for general illumination.